Today, Karyn and I, and a friend of ours, Ted Smith, traveled to the Morley Nelson Snake River Birds of Prey National Conservation Area in search of Burrowing Owls. The intent was to see and photograph the Owls to provide reference photos for Karyn's watercolors and Ted's wood carvings. Of course, I had an interest as well. A year ago I began by bird life list. This is a list of each bird species that I have confidently identified (sometimes with some help). I actually keep two lists, one for identification and one for those that I have identifiable photos of. Today would be a good day for both lists! We started down into the conservation area. This is believed to be the largest density of birds of prey in the world. 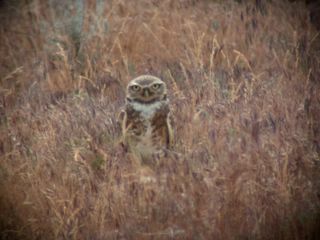 Just a short distance in, Karyn and Ted saw a Burrowing Owl. I stopped the car, but the Owl had moved out of sight. We waited for some time, but it never came out. Just up the road we found a Swainson's Hawk. I had probably seen one before, but just assumed it was a Redtail Hawk. This one was positioned for some good photos and a positive identification. I could mark this one on both lists. 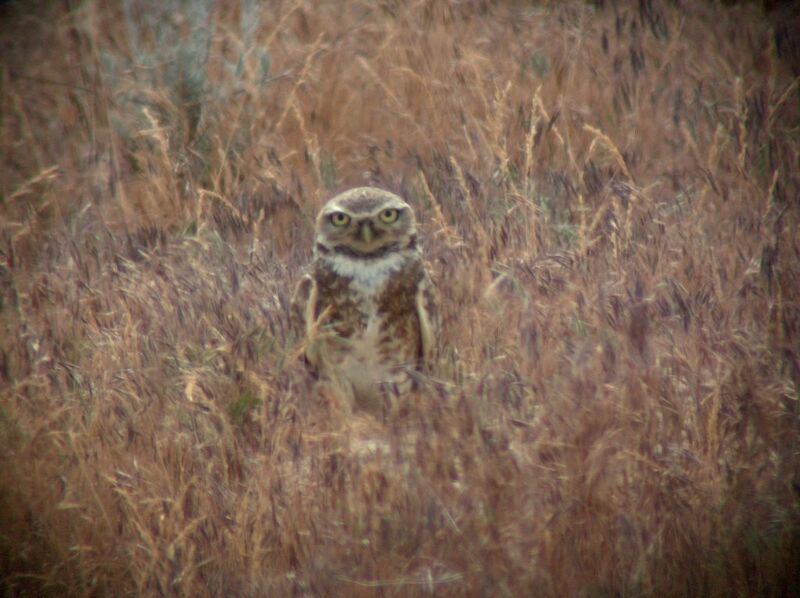 We search for a number of miles for Burrowing Owls, but we found none. We did see a Raven's nest with three chicks in it and a few Turkey Vultures. We decided to head down to Discovery Point to try and spot some Falcons. A half mile before the turn out, Karyn yelled "Stop!" 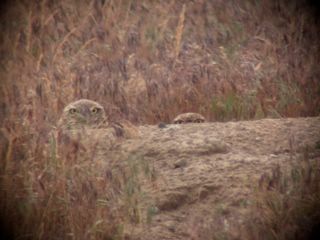 She had found another Burrowing Owl. There it was in pretty good sight of the road. It quickly moved down into its hole near another Owl (Photo 1 below). We waited for sometime, but it did not move back out. Just as we were deciding to leave, a prairie dog ran over near its hole. 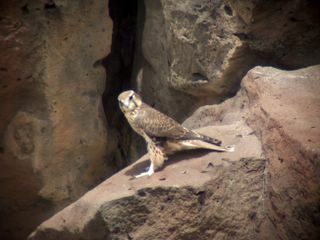 One of the Owls chased it out (photo 2). These would be good checks on both lists. Discovery Point overlooks the Snake River canyon. Arriving at the overlook we were eye level with an Osprey and a number of Ravens. We watched a Golden Eagle lift off the far rim of the canyon. Just then, the highlight of the day, two Prairie Falcons flew overhead and one landed just 50 yards away on the canyon wall. This one posed for 20 minutes in various positions. I took about 50 photographs, providing a very solid check on both of my bird lists. What a great day. On the way back we added one more by photographing a Rough-Legged Hawk. I think we will be making this trip again!. Update 6/9/2006 - After sharing some photos of the "Rough-Legged Hawk" with Carel of Rigor Vitae: Life Unyielding he determined that it was a Redtail Hawk instead. That's pretty neat that you saw a Roughleg. Could you tell if it was a young one? I could be wrong, but I would think it's quite unusual to see one there this time of year. We've hardly had any of them winter down here the past few years. That young Prairie looks like his primaries are completely down. In central Wyoming they're just hatching. After sharing my not so good photos of the "Rough-Legged Hawk" with Carel, he determined that it wasn;t a rough-legged after all. It was a Redtail.